Dennis Gaumond (Gomo) has been a professional musician for about thirty years, playing guitar, harp, and bass in various blues bands (Black Cat Bone, Shaky Ground, Gomo’s Blues Band). He has opened for some notable acts (Eric Burden and the Animals, Humble Pie, The Ozark Mtn Daredevils) and shared the stage with many notable blues performers (James Cotton, A.C. Reed, Phil Guy, Wild Child Butler, Mel Brown). Two albums were released with Black Cat Bone: Take It On Further and Bye Bye Blues. Dennis was given the Al Cromwell Award for folk/blues during the 10th Annual Great North Wind Porcupine Awards. In 1996, he released his first CD, ‘Hiding Out in Limbo‘, which was co-produced by Jeff Bird (Cowboy Junkies). 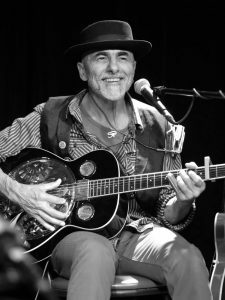 This album was a collection of mostly unaccompanied acoustic songs recorded live and only hinting at the direction Gomo’s music was to take with his next CD, Nipissing. Featuring a quirky song-writing style, it received substantial airplay and landed him some high profile gigs and festival appearances at Toronto Harbourfront, Barry Jazz-Blues Festival, Toronto Downtown Jazz Festival, to name a few. A showcase at the OAC’s Contact 98, and hosting a TV series called Applause, have also helped to open new opportunities. Whether in an electric or acoustic context, Dennis’ live performances sizzle with passion and vitality. A deep interest in ethnic world music took Gaumond on a different journey and he formed a band called The Bhadra Collective, an 8-piece band with exotic instrumentation that played an innovative blend of world-beat styles. In 2007 he released Soon Come Shekinah, and toured the band across Ontario. Dennis Gaumond currently plays music in several contexts, electric, acoustic, original songs, chant, world/exotic, etc. Current projects include Euphoria (ecstatic dance music), with Gary Diggins and Jen Gillmor, Black Cat Bone (blues and beyond), with Jesse Turton and Tom Wolf and Purple Passionfruit (psychedelic dance party) with various musicians. Of current projects, Dennis is most excited the duo Jennis with Jen Gillmor. The debut CD, The Current, was released on May 30, 2014. Jen Gillmor is a Canadian-American dual citizen based in Toronto, Canada. Member of The American Federation of Musicians Local 226: The Central Ontario Musicians’ Association. Jennifer’s musical exploration has covered rich and varied territory. She is a multi-instrumentalist with a musical family that includes bass guitar, cello, kamel n’goni, didgeridoo, found and made objects, flutes, various percussion, berimbau,musical saw, jaw harp, and sample-based sequencing. She has performed and recorded in projects ranging from funk to folk, rock to reggae, music influenced by traditions of African and Celtic cultures as well as experimental projects that can draw few comparisons. Jennifer has composed and recorded for film, video, dance, theatre and multimedia projects. She has toured internationally and appeared in nationally broadcast music videos and on various local and national television and radio shows. Jennifer recently spent six months on a retreat from Toronto in a cabin on the Telkwa High Road outside of Smithers, BC where she focused on exploring her musicianship with many instruments and recording gear. The resulting debut solo album, High Road Haven, is available now through Bandcamp and iTunes. Jen’s current performance focus is Jennis, a duo with Dennis Gaumond whose debut album The Current was released in May of 2014. 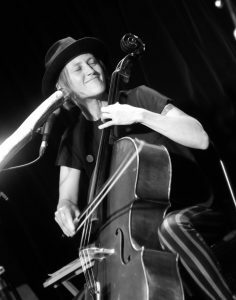 She has either recorded, performed and/or toured with: Gary Diggins, Errol Starr Francis, David Hickey, Anna Gutmanis, DubTonic, Rachelle Van Zanten, Los Gringos Salvajes, Peter J Slack, The Bhadra Collective, Triund, Random Order, Brazen Crush, Dreamfire, Kelly and the Kellygirls, Roach Motel, Amer Diab, Yala (with Jamie Stone & Morgan Doctor), Evalyn Parry, celtic fiddler Eric Nagler, The Wetspots, Pam Gerrand, Tucker Finn, Lyndell Montgomery, Dropdeadbeats, The Matriphiles, Roma (with Michelle Josef, Marg Stowe & Wally Jericho),Women Ah Run Tings, Myk Gordon, Tamara Williamson, The Kitchen Sink Project, Meryn Cadell, Snowdogs, Amy Fritz and The Nancy Sinatras. A member of AIM Toronto (association of improvising musicians toronto) Jen is an avid improviser who has performed as part of Toronto’s longstanding Ambient Ping, provided live music for Tribal Dance Community, Martha Randall’s NIA classes and other events with Gary Diggins. She creates soundscapes regularly for Kathleen Rea‘s Contact Dance Jams and has also enjoyed DJing for ecstatic dances such as The Move and Boogie Groove. Jen has provided musical accompaniment on many occasions for Fireflow Yoga Studio and for Bibi Rahim-Hahn‘s Flow Yoga class at Yogaspace in Toronto. Jen was Sound Designer for Maja Ardal‘s new play Her2, produced by Nightwood Theatre in 2015 and for the Canadian Stage production of Love and Information in 2018.